The Alicante Town University Venue is a building which has being transformed for adapting itself to new needs, but preserving its basic structural elements, hence that it can be considered nowadays as an emblematic place, due to its antiquity, emplacement and relationship with Alicante’s urban history. ALICANTE TOWN UNIVERSITY VENUE: A HOUSE FOR WORDS, GESTURES AND PICTURES FROM INSIDE OF THE SOCIETY OF KNOWLEDGE. INSTITUTIONAL ALICANTE TOWN UNIVERSITY VENUE. The official UA address is in this building, which is frequently used of institutional events, meetings, public presentations of university projects, official receptions, etc. In the Alicante Town University Venue take place many conferences, workshops, colloquiums, and so on; they are organized by different departments at the UA and other associations. The University Venue in Alicante collaborates actively in these events through its technical resources, media and the support of a qualified staff. A CENTRE FOR CULTURE AND EXTRACURRICULAR ACTIVITIES. 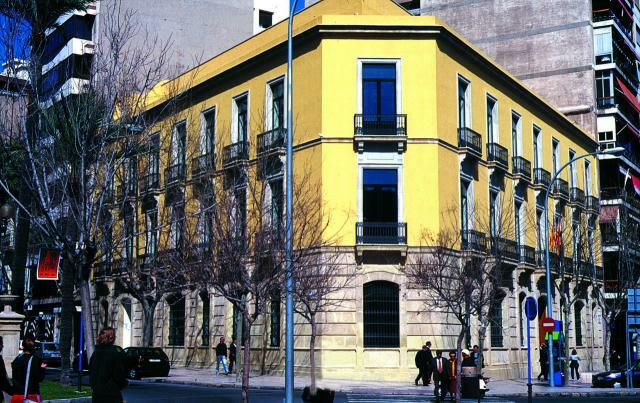 The Alicante Town University Venue promotes every academic year a wide proposal in cultural and civic activities; a huge part of them are Observatory’s proposals of any kind. The activities in the Venue are series of conferences, music, film clubs, literary or contemporary arts meetings, exhibitions, meetings about current events, etc. They are celebrated special commemorations such as the Constitution Day, Miguel Hernández death anniversary and Maisonnave Award. The Venue develops courses about different themes and they are given by teaching staff of the UA and other specialists. It receives a great amount of the Permanent University activities, with a wide participation of the older people. At the same time, they are given some of the Summer Courses of the Rafael Altamira University and Language Courses for foreigners. A CENTRE WHICH IS OPEN TO SOCIETY. The University venue is opened to any kind of associations, NGOs, trade unions or platforms for the realization of its activities and meetings. The venue organizes cultural events outside its building, collaborating with other entities, as El Club Información, Casa Del Mediterráneo, Chamber of Commerce, Manuel Peláez Foundation, and Alicante’s city council, Booksellers from the Alicante Association and Youth Council, among others. Usually, the attendance and registration for the activities in the University Venue in Alicante are free until the rooms are full of capacity. Occasionally, some courses may require a previous payment or demand some professional or academic requirements. Conferences follow the inscription norms and registration order that the organizers establish. The Alicante Town University Venue has a fixed program every academic year in which sometimes they are added other series, workshops and events. When the Venue is not being used by the Venue organizers, its facilities are allowed to other solicitors, although they have priority those requests from the UA. The rest ones must address to the Venue’s Academic Direction and would be considered following the order by which they were registered. The University of Alicante may charge them for the usage of the facilities or technical resources, although normally the facilities are free allowed to those non-profit-making entities and those entities which does not charge for the attendance to the events they organize. PERSONALIZED INFORMATION ABOUT THE ACTIVITIES. Apart from the habitual information mechanisms for the activities in the Alicante Town University Venue, through the media or diverse papers, you can find more detailed information in this web page. If you wish to, you can find a personalized news bulletin with a resume of the weekly programmed activities; you must request it through this application form.